Within the next few weeks the majority of the fall migrants will have departed Illinois for their winter residences. While most of the warblers have already moved on, I’m still seeing a lot of sparrows and an occasional unexpected visitor like the Rusty Blackbird, which is currently on the Audubon Watchlist for vulnerable species. Last week I literally stumbled across a snipe. This is another bird I did not expect to see at a small pond along a nature trail in a residential area. I had left the main path and was walking through the brush towards the pond and came within a few feet of stepping on it. It’s color blended so well I didn’t see the bird until it flushed out of the grass. When I saw that long beak I knew it wasn’t one of the usual residents. Of course I wasn’t leaving until I found the bird and eventually I located the snipe who was standing on the far side of the pond almost out of range of my zoom lens. A Snipe is a medium-sized shorebird and is common over most of North America. It spends the summer in Canada and the northern US and migrates to the southern US and Mexico for the winter. It’s a year-round resident in a few areas in the northwest. It has a very long, flexible bill that it uses to probe in the mud for small invertebrates. It eats larval insects, worms, crustaceans, mollusks, some vegetation and seeds. The Wilson’s Snipe is one of the few shorebirds that can still be hunted legally. An elusive bird that’s difficult to hunt, the snipe led to the use of the word sniper in terms of a sharpshooter in the early 19th century. The clutch size of the Wilson’s Snipe is almost always four eggs. The male snipe takes the first two chicks to hatch and leaves the nest with them. The female takes the last two and cares for them. Apparently the parents have no contact after that point. The Common Snipe is found in Europe and Asia and looks almost identical the North American Wilson’s Snipe. Until recently they were considered the same species. I always learn something from your posts. I didn’t know about snipe/sniper either. I’m really enjoying your series on the migrating birds. I didn’t make the sniper connection either until I researched the bird after I took the photo. That is, indeed, a gorgeous bird, and plethora of bill going on. The colorings are gorgeous….. he/she is doing a lot with simple brown and white. I don’t think I’ve seen one of those – I feel sure I’d remember that beak. It’s a bird that doesn’t like to be found. Perhaps because they are hunted… or maybe they’re reclusive by nature. I’ve seen the Wilson Snipe on in a bird book, but this is the first time seeing a real one, albeit on a photo. 🙂 I’ve been exploring new birding sites in my neck of the wood, and have seen something I haven’t before and that’s the male and female Red Crossbill. They are a beautiful pair, male’s orange, female’s yellow. I should show you the photos some other time. But today, I’ve something different. That was the first time I’d seen one in person too. I was pretty sure it was a snipe but I’m glad I got a photo so I could verify it with my bird guide. They are so elusive and difficult to see. This one went right back into the brush and I couldn’t find it again. Lovely that you were able to capture his photo! Thanks for posting so much info on your bird sitings. I am a bird watcher too ! Still so much to learn though! The words ‘on’ meant to be ‘only’ in the above comment. Sorry for the typos. I love your weekly bird pictures. I thought you might think I was trying to compete with my photos this week! I did have a job getting them to stay still on the tree. How cool to know the derivation of the word ‘sniper’ . Completely unexpected! Thanks. Interesting to learn about a word in this post, as well as a bird! Lovely photo, as always. A great shot of an unusual bird. Love learning about new birds from you! Here’s my Saturday Snapsot. You’re very brave, stumbling about in bushes looking for birds. I’m a little afeared. He’s so cute! I love the variety of length and shape of the shorebirds! I always love your photos. 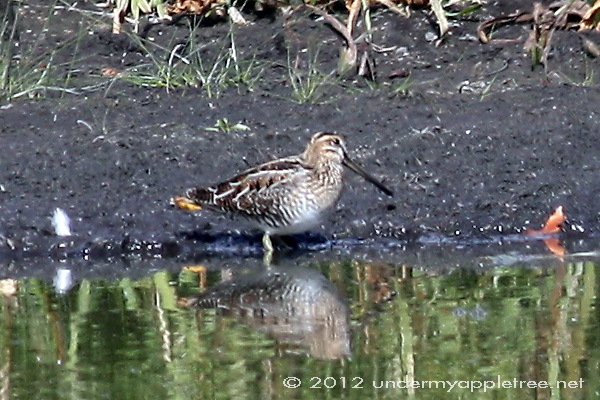 The snipe’s bill almost looks too long for his size. Very interesting shot.